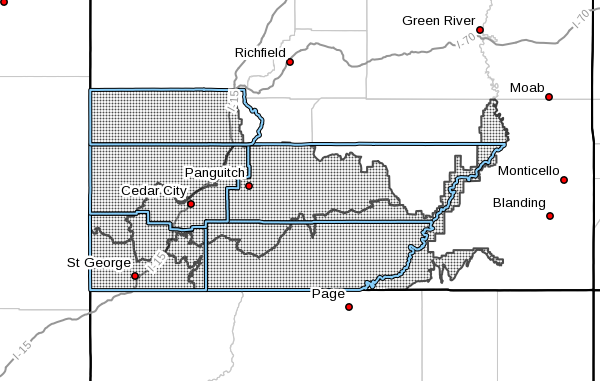 ST. GEORGE – The National Weather Service has issued a red flag fire warning for Thursday in parts of Southern Utah. The warning for wind and low relative humidity conditions will be in effect from noon until midnight Thursday. A red flag warning indicates that critical fire weather conditions are either occurring now or are imminent. A combination of strong winds, low relative humidity and warm temperatures can contribute to extreme fire behavior. Portions of southwestern and Southern Utah, including the areas of the Mojave Desert, Color Country and Grand Staircase, including all of Washington, Iron and Kane counties, and parts of Garfield, Beaver and other counties. Southwest gusts of up to 30 mph are expected. Thursday afternoon’s relative humidity is expected to be between 3 and 9 percent. Any fires that develop will have the potential to spread rapidly. Outdoor burning is not recommended. Avoid driving or parking your vehicle in tall grass. Never throw a lighted cigarette out of a vehicle. When pulling a trailer, attach safety chains securely; loose chains can drag on the pavement and cause sparks, igniting roadside fires. Look behind you before driving away from fire-sensitive locations such as areas with tall grass or campsites to check for signs of a developing fire. Always use a spark arrester on internal combustion engines.